New research by The Leprosy Mission England and Wales highlights the reasons why women are less likely to be treated promptly for leprosy and are more likely to become disabled and cast out from society than men. The latest WHO global report, shows there are fewer women reported as ‘new cases of leprosy’ than men. Out of 210,758 people, only 81,860 or, under 40% were women. However, no medical evidence suggests that leprosy is more likely to be caught by men than women. The Leprosy Mission’s soon-to-be-published research concludes that a major cause of late-diagnosis of leprosy in women is the fear of stigma and being ostracized from family and community. The stigma that surrounds leprosy can have such a devastating impact on a life, that going forwards for a diagnosis might feel very risky. 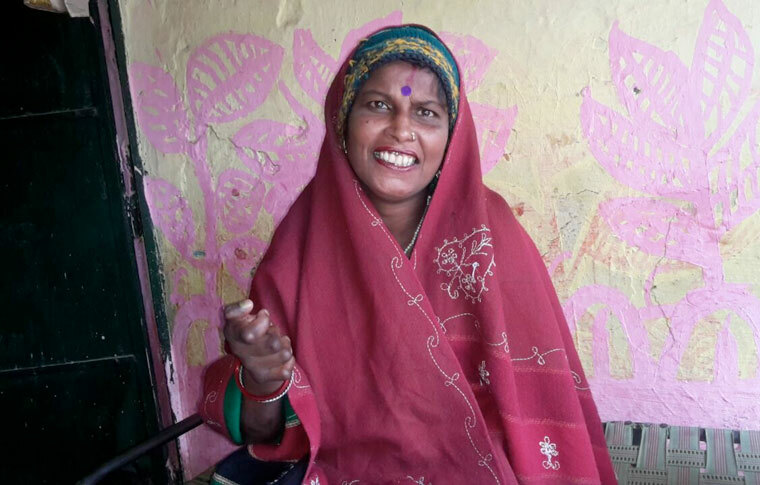 Stories like Belawati’s from Uttar Pradesh in India are all too common. Belawati was married very young and soon had two children. She led a simple life and mostly stayed at home, doing household chores and taking care of the children. After a few years of marriage, she developed white patches on her body. Unaware of what they were, she decided to ignore them. Over the next few years the patches grew in size and number and then Belawati’s hand started to claw and she developed severe impairment. Family members started to avoid contact with her and her husband also kept his distance. Belawati was desperate about her situation, but did not know what to do as she never went out alone or had any friends. One day Belawati’s husband took her to Agra Hospital to get her treated and left her there. When she realised that she had been abandoned, she was broken-hearted. One of the staff there even suggested that she moved to the Ramganga leprosy colony. After her treatment was finished, she went back home where she discovered that her children had been told that she had committed suicide. Hearing this news, Belawati lost all her hope of being accepted by her husband again and she went to live at the Ramganga leprosy colony on her own. However, thanks to personal resolve, she restarted her life and married a man who was also affected by leprosy. She was again blessed with two children. Leprosy is a disease of poverty and within the 11 countries that The Leprosy Mission England and Wales works, across Asia and Africa, women are generally more disadvantaged than men in terms of access to food, healthcare, education and work opportunities. Women often have less exposure to communication and information making accessing effective treatment for leprosy extremely difficult. They are often dependent on obtaining permission from their father or husband to seek treatment. Marriage is for many women in leprosy-endemic countries the only real economic security, but it makes a woman economically dependent and can mean she does not have the skills or opportunities to cope when rejected by her family, divorced by her husband and left destitute due to leprosy. The Leprosy Mission England and Wales uses community awareness programmes, including those targeted specifically at women and children, to ensure that women and girls learn about the early signs and symptoms of leprosy, their right to health and the urgent need to access treatment to prevent disability. In addition, hospital outreach programmes visit remote communities to screen people for leprosy, paying particular emphasis on engaging with women’s groups and schools so women and girls can access early diagnosis and treatment. Through examining the household contacts of a person diagnosed with the disease, the mission can ensure that women and girls who are less likely to come forward for treatment don’t miss out on early diagnosis and the other health services they require.